1) Make the CD or USB with the file and directory like below. 2) Insert the CD or USB which you make. 3) Then “Update” Pop-UP will be shown. Please select the "OK" at this menu. 4) Then the update is progressing. 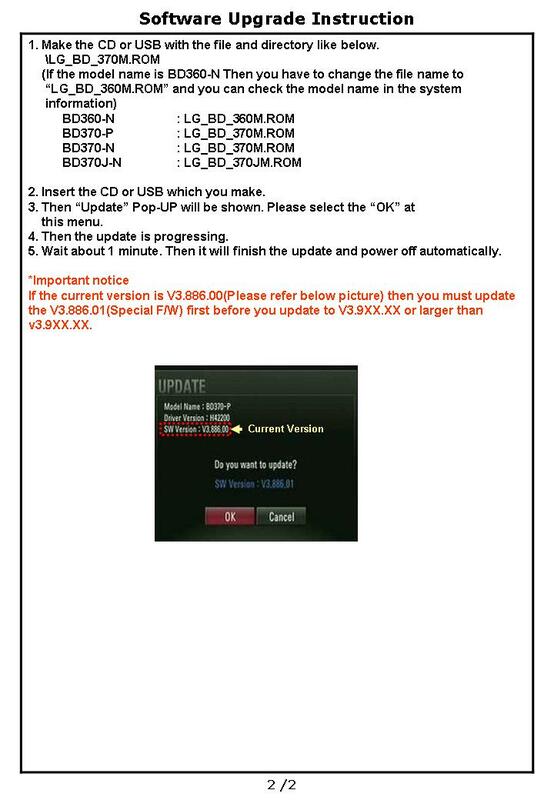 Program update for BD360-N and BD360-P.
Updating by using the newest firmware. The update method is refer to the attatchment. : Updating by using the newest firmware. 1. Make the CD or USB with the file and directory like below. 2. Insert the CD or USB which you make. 4. Then the update is progressing. 5. Wait about 1 minute. Then it will finish the update and power off automatically. Modify YouTube connection at the initial step caused by Google server changing. Program update for BD360-P and BD360-N.